According to Wikipedia, the term Business Intelligence (BI) refers to technologies, applications and practices for the collection, integration, analysis, and presentation of business information. The purpose of Business Intelligence is to support better business decision-making. In our opinion, business intelligence is a three-part process. The first part is taking data and making a decision that will spur on a different outcome (that the business wants or that the internal team needs). Those outcomes result in providing value to the customer in some way (such as being able to deliver minimal cost, sustainability, and/or more robustness in the business). Eventually you get an outcome you need that will help improve your business and its bottom line. What Options Are Available in Fishbowl? Now, we coined them the name “Legacy Reports” as Fishbowl will be changing the way they approach reports. They use a technology called JasperReports, which actually requires a design application called iReport. It is a prepared output page level report. However, it may not be better suited for people who are used to the excel format with cells, columns, and rows. It served us well for a very long time, but it is time for a change. In the Data Module, you are able to view and export information from the Fishbowl database. You are able to run queries, save, and export them into .CSV and .XLS files. It is important to note that the Data Module requires you to understand “SQL,” and the Fishbowl database. But Fishbowl does provide a data dictionary, and a fair amount of tools for you to learn what it is. It also has parameters for those who are not familiar with editing a ”SQL Syntax.” It allows them to just run a query and prompt a parameter such as “date range” and then go on. Excel now has a feature called ODBC queries. ODBC stands for “Open DataBase Connectivity.” It is great for us as practitioners of business intelligence to have this tool. We can take the data from Fishbowl, collect everything we need, and transfer it to the business owners who are more familiar with Excel. They will have all of the refreshable raw data, and they can put in additional formulas, pivot tables, other analysis and then share them with your team members. It will connect to the Fishbowl database and make it available for everyone to see! Fishbowl is able to work with outside analytical platforms such as Microsoft PowerBI and Tableau. Most people know about PowerBI over Tableau because of its huge marketing presence in our space. But both platforms are great at connecting to the database in Fishbowl. Back in 2016, Fishbowl was using a database called Firebird, but they are now using more recognizable databases in MySQL. It is now very easy to learn the Fishbowl database, and to connect to MySQL. BI Script is the newest addition to the Business Intelligence Landscape in Fishbowl. The BI Script module allows the creation of robust HTML reports. It is a developmental tool that goes along with Fishbowl. You now do not have to install and maintain a separate application to write reports. You can use BI Script to do it all inside of Fishbowl. Now the biggest paradigm shift with BI Script is that they started using web technologies to build reports. They are now at a level of accessibility where it is easy for most businesses to find help. When working with various companies, more often than not, the needs are more tactical than strategic. Meaning, “I need to get this answer right away,” “I need to react to this question that I have and must get an answer as quickly as possible.” That’s usually the triage aspect of the most consulting our company will provide. But there is also another aspect of consulting where it is a lot more strategic. When looking at the strategic approach it is more long term. We’re looking at the possibility of being able to get multiple insights out of our efforts of designing a particular BI solution. We also want to be able to design something easily: by using the Fishbowl platform. We use the data that we receive from third parties, and being sure that we are able to find homes for that data (all while making sure to keep the data fairly clean). 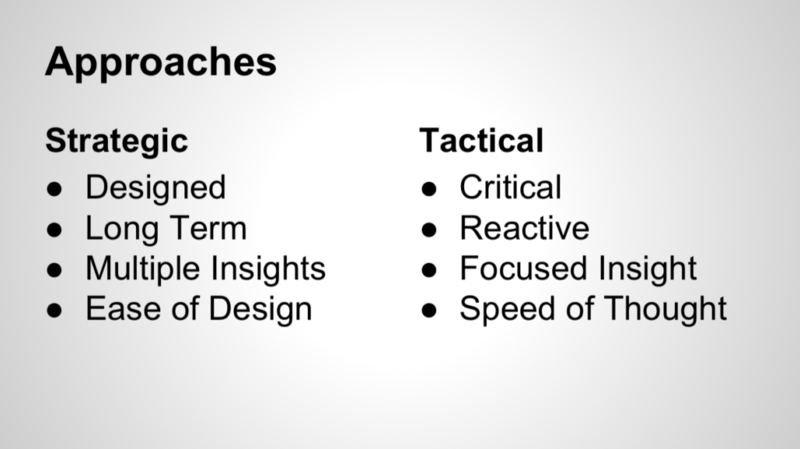 The tactical approach is a lot more time-critical: we are being more reactive because we have a very focused insight that we want an answer for. What we are looking for in the tactical approach is almost like “the speed of thought”. As we continuously get answers to our questions, new ones may arise as we keep going. But once you use the platform more, you will start to get the hang of it and will be able to answer your new questions quickly. Now how does this apply to the tool set? Some tools are better suited for different aspects; some could have a little bit of both. The legacy reports were always a strategic approach because you needed to have planned time with a consultant who was be able to have the resources you need to build your report. To this, Fishbowl responded with a data module. Where now it is possible to write queries and get an answer right away; it was possibleto talk to someone on the phone and get an answer live. That person is able to copy and paste a query so you could get an answer very quickly. You can keep those answers, but eventually would want to transition into a more permanent/strategic solution. Companies who know what kind of visualizations they need, but have a hard time navigating the Fishbowl platform can turn to Excel ODBC, Power BI and Tableau. Now, Tableau bills itself as a “speed of thought” type of solution. But, once you have input more Fishbowl data into the platform, it becomes much easier to use and comes out on the strategic end. BI Scripts could be tactical, because it’s based on the people you find. Because anyone new to the platform will take time to mature and develop into more consistent outputs. That is one of the things that concerns us about anything new … how is this going to change the way customers approach Business Intelligence. In conclusion, we are very excited about the changes that Fishbowl is bringing onto the table with their new 2018.7 release. Our company is right behind them in being able to provide solutions for all of the different technologies that Fishbowl has offered. We think it’s going to have a positive affect on companies all around! If you have any questions about BI tools, BI solutions, queries, databases…or even if your needs are more tactical where you need an answer that day, we are happy to help! If you would like us to come to your offices and review your Fishbowl process, or if you are interested in the Fishbowl platform and would like to talk to us how that could apply to your business, call us today to get started! We work with Fishbowl Inventory, QuickBooks and a host of other applications that drive many of today’s modern businesses. Aside from our professional expertise, it is our overall business acumen and quality of service that truly sets us apart from the competition.